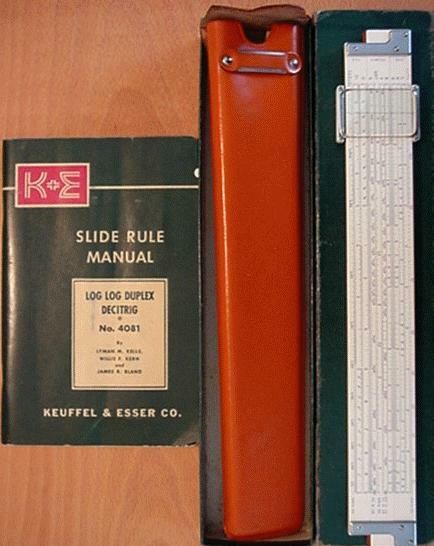 The particular instrument he gave me is a Keuffel and Esser “Log Log Duplex Deci-Trig” slide rule model 4081-3S. It was a source of some amusement to my father when I asked if I could keep his old slide rule. He had passed it along to me to entertain myself with since his work by that time had moved on to electronic calculators. Certainly it is the case that calculators offer a much higher level of numerical accuracy than a slide rule. However, unlike a calculator, a high-quality slide rule places you in a direct relationship with the numbers and equations you are working through that cannot be found with calculators. And this relationship is beautiful. For one, there is a practical matter that tends to get overlooked. When working with calculators, numbers appear almost by magic, spewing forth in ridiculous decimal places that offer a pretense of accuracy without any presumption of understanding. That pretense of accuracy, I submit, is a significant problem. The accuracy of our measurements seldom goes beyond two decimal places, but the calculator will give an answer to 10 or more. This is an illusion, not a conclusion. With a slide rule, the limits of accuracy are already built into the calculating process itself. Thus the slide rule puts you in a truer relation to the practical facts in hand by denying you the illusion of unlimited accuracy. This truth has the rough-hewn beauty of a tree-limb found wild in the woods and hand polished to a personal walking stick over a perfectly synthesized, mass-produced crutch. But there are quite real issues of theory here as well, both mathematical and aesthetic. Upon first examining the slide rule, the numbers and registers can appear to be scattered across its length in a haphazard, even chaotic manner. But there is an order and symmetry to the slide rule that is its defining characteristic. The registers, far from being chaotic, are uniformly spaced according to their base 10 logarithm. (“Log” for short. The base 10 log of a number X is that number Y such that 10Y = X. Thus the log of 2 (or just “log 2”) is approximately .31.) Indeed, if one flips my slide rule over to look at the L register on the back, one will see that this is the only register that is evenly spaced; and, as one might then expect, this is the actual logarithm scale. Multiplying and dividing on the slide rule is thus a matter of adding and subtracting logarithms. Since all numbers are evenly spaced according to their log, such activities are really just composition (plus or minus) of simple, linear lengths, like two simple rulers held up one edge against the other. In this way, fundamental mathematical relationships reveal themselves to be of a kind with the most basic sorts of measurement acts: the slide rule is, after all, “simply” a multi-modal ruler. This reduction of basic mathematical and numerical relations to that of the comparison of extensive lengths is a rather exotic and difficult theoretical development. I hold it in my hands. Symmetry is about balance, proportion, distribution, etc. The Greek word “temperance” (roughly “sophrosyne”) was originally an aesthetic ideal that came to be translated into a notion about a well lived human life. The very word “aesthetic” comes from the Greek word for “experience.” Our notion of beauty is then in turn something that the Greek’s held up as a fundamental ideal of human existence at its most basic, and most basically human. And such existence finds one of its most fundamental expressions in the group-theoretic expressions of unity and symmetry that I hold in my hand: this precision instrument, this lovingly crafted slide rule. But the beauty of symmetry is not just to be found in those symmetries as they are manifested; it is there, too, to be found in those symmetries that are strategically broken. Some (mathematical) relations lead to zero or infinity; some to both. When that happens, the symmetry ends there — the scales are shattered, the mirror crack’d. But the slide rule enables and empowers these recognitions; the “LL” registers trail off from plus and minus zero; others track the dwindling of decimal places. Each such dwindling shadow of a number retains its original symmetry (one can invert the mirror, and return to the land of integers) even as it carries you over the falls toward a silent oblivion of non-mathematical answer. But the balance is found even as it is lost, the tipping point enunciates the level plane, the boundless is found in limitation. The infinite is discovered in the ruled line. Obviously more could be said here, but I’ve said too much already. Aristotle gave the principle of the form and purpose of beauty to the idea of symmetry. Plato gave to the physician Eryximachus the poetic discourse on the connections between balance, harmony, life and love in The Symposium. My father gave me a slide rule. My roommate in undergraduate was a math major. He and I often discussed how the vast majority of math is taught with a tragic lack of imagination: there is no reference to historical context or the development of the ideas, there is no discussion as to purpose or goal, there is only the rote practice of calculation. There is no discussion as to the artistic side of math, where it becomes truly interesting for me. If mathematics had been taught as a form of modeling and we had been given more freedom to experiment, I probably would have been vastly more interested. As it was, I saw no point in doing something that was presented as merely a mechanical process. Since then I have found wonderful examples to the contrary and improved some of my own skills. My own relationship to math will probably remain similar to that of a young student reading Homer in translation as opposed to the original Greek, but I am thankful I have glimpsed over the horizon and seen the better world. I’d like to add a second thought, if I may. I enjoyed this post, especially your description of the slide ruler as a mediator between yourself and a larger world of understanding. It seems to me that a similar relationship occurs with sextants, sun dials, star charts, compasses, and other similar instruments. These all combine functionality and aesthetic in a physically complex object that mediates understanding between immediate experience and complex systems of understanding. In terms of cognitive metaphor theory (Lakoff and Johnson) these objects provide metaphorical connections between embodied experience and an abstract concept. In terms of philosophy of symbolic form (Cassier) these objects embody key metaphors that help structure experience (this may be a stretch but it sounds nice). In either case it seems that the instrument in question functions as a mediator between embodied experience and a completely abstract system of understanding. By integrating physical dimensions with conceptual measurements they become metaphors themselves, and help us relate their shapes to the conceptual models under investigation. The beauty of these instruments is (as you say) they can be held in one’s hands. They can expand and our world simply by allowing us to explore the world in terms of their instrumentation. In this manner they are not so different from an artist’s brush, an extension of our own curiosity and creativity that helps us engage the world and express our relation to the world in abstract thought. Whitehead noted that the history of mathematics was one of the best ways of actually teaching mathematics. At the time he was writing this, there weren’t that many (if any!) adequate histories of the subject to be found. That has changed some in the intervening century.